Charlton lost their unbeaten league record as Bournemouth picked up a fourth win in their last five games. The Cherries were ahead within three minutes as a corner was not cleared and Callum Wilson met Marc Pugh's left-wing cross with a close-range finish. Charlton went close when Johann Berg Gudmundsson curled in a free-kick but Artur Boruc tipped it round the post. Keeper Stephen Henderson kept Charlton in the game after the break with a fine low save from Andrew Surman. But while Eddie Howe's side could not find a second goal, Charlton's travelling fans had to reflect on a largely toothless display. Charlton have now lost the last remaining unbeaten record in the Championship, hours after Nottingham Forest suffered their first defeat in the early kick-off at Cardiff. The Addicks were still finding their feet when a stray pass fell to Matt Ritchie, whose left-foot piledriver was parried by Henderson for a corner, from which Pugh's trickery deceived Chris Solly, and Wilson found room in a crowded box to slot home his eighth of the season. That was only the third time all season that Bob Peeters's side had gone behind and Wilson nearly doubled the lead when he deflected Ritchie's low free-kick goalwards but the ball was blocked. While striker Karlan Ahearne-Grant, 17, posed the hosts some problems, Charlton's best chance came when Gudmundsson's free-kick was heading towards the top corner until Boruc somehow kept it out. Peeters made a double substitution and a formation change at the break, but it did little to change the game as Bournemouth piled on the pressure, winning 16 corners. Winger Pugh continued to torment full-back Solly, and while Ritchie was happy to shoot on sight, his delivery from corners remained a threat as Steve Cook twice headed wide. The visitors lacked invention and while Addicks substitute Lawrie Wilson headed straight at Boruc when well placed in stoppage time, it was too little, too late. Bournemouth boss Eddie Howe: "We came out of the traps so quickly and that was really what I wanted. We used the international break as a real hard workout and I am glad the lads have got their win today because they deserved it. "We saw the week as the ideal time to work on that fitness and we worked them really, really hard. It played dividends today because I thought we played really well." Charlton manager Bob Peeters: "Bournemouth did very well, they played very high and we did not have a solution for their attacking threat. I think we looked much better in the second half but overall we were not at our best and they deserved the win." 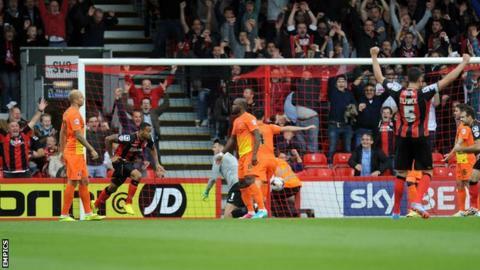 Match ends, Bournemouth 1, Charlton Athletic 0. Second Half ends, Bournemouth 1, Charlton Athletic 0. Attempt missed. Lawrie Wilson (Charlton Athletic) right footed shot from a difficult angle on the right is close, but misses to the right. Attempt saved. Lawrie Wilson (Charlton Athletic) header from the right side of the six yard box is saved in the bottom right corner. Assisted by Callum Harriott with a cross. Foul by Brett Pitman (Bournemouth). Corner, Bournemouth. Conceded by Lawrie Wilson. Corner, Bournemouth. Conceded by Tal Ben Haim. Corner, Bournemouth. Conceded by Chris Solly. Foul by Yoni Buyens (Charlton Athletic). Attempt blocked. Brett Pitman (Bournemouth) right footed shot from the right side of the box is blocked. Assisted by Matt Ritchie. Dangerous play by Karlan Ahearne-Grant (Charlton Athletic). Attempt missed. Steve Cook (Bournemouth) header from the centre of the box is just a bit too high. Assisted by Matt Ritchie with a cross following a corner. Corner, Bournemouth. Conceded by Rhoys Wiggins. Offside, Charlton Athletic. Tal Ben Haim tries a through ball, but Rhoys Wiggins is caught offside. Attempt blocked. Matt Ritchie (Bournemouth) left footed shot from outside the box is blocked. Assisted by Callum Wilson. Attempt saved. Karlan Ahearne-Grant (Charlton Athletic) right footed shot from outside the box is saved in the bottom right corner. Assisted by Jordan Cousins. André Bikey (Charlton Athletic) wins a free kick in the defensive half. Attempt blocked. Matt Ritchie (Bournemouth) right footed shot from outside the box is blocked. Assisted by Simon Francis. Attempt missed. Matt Ritchie (Bournemouth) left footed shot from outside the box is close, but misses to the right. Assisted by Brett Pitman. Substitution, Charlton Athletic. Lawrie Wilson replaces Johann Berg Gudmundsson. Delay in match Jordan Cousins (Charlton Athletic) because of an injury. Attempt missed. Harry Arter (Bournemouth) left footed shot from the left side of the box is too high. Harry Arter (Bournemouth) hits the bar with a left footed shot from the centre of the box. Assisted by Callum Wilson following a corner. Attempt saved. Andrew Surman (Bournemouth) left footed shot from the centre of the box is saved in the bottom left corner. Assisted by Harry Arter. Corner, Bournemouth. Conceded by Jordan Cousins. Attempt blocked. Matt Ritchie (Bournemouth) left footed shot from outside the box is blocked. Assisted by Simon Francis. Stephen Henderson (Charlton Athletic) is shown the yellow card.